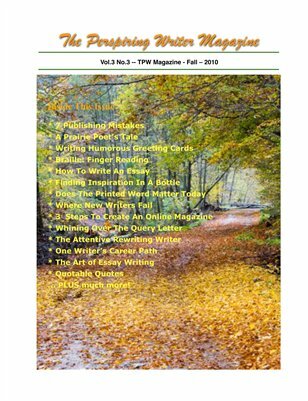 Inside this issue of The Perspiring Writer Magazine, you will find articles by our professional staff and well-known writers, like Bob Bly, Rob Parnell, Patricia Fry, Susan Malone, and others. * 7 Publishing Mistakes * Prairie Poet's Tale * Writing Humorous Greeting Cards * Braille: Finger Reading * How To Write An Essay * Finding Inspiration In a Bottle * Does The Printed Word Matter? * Where New Writers Fail * Steps To Create An Online Magazine * Query Letter Problems * The Attentive Rewriting Writer * One Writer's Career Path ... PLUS much more! TPW Magazine is the hardworking writer's best friend.